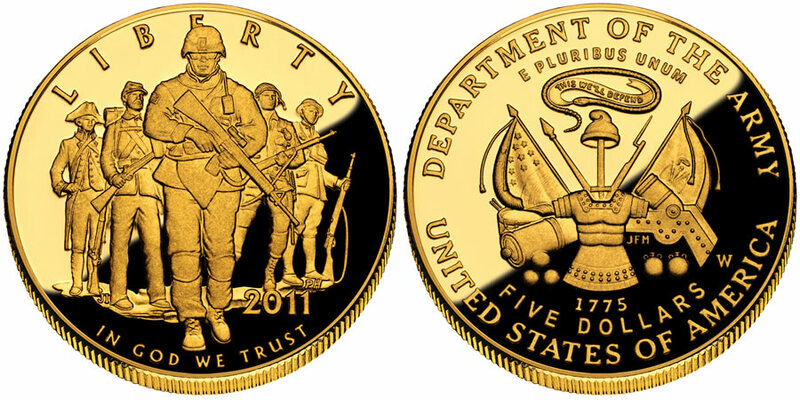 The 2011 United States Army Commemorative $5 Gold Coin is one of three coins to be issued by the United States Mint in 2011 to honor the nation's oldest military branch. The coins are scheduled to be released on January 31, 2011. Along with this gold coin, the Mint will also strike an Army Silver Dollar as well as an Army Half Dollar Coin. All three honor the United States Army which was established in 1775 and has served the nation continually since, operating in both peace-time and in war. The coins were authorized by the United States Army Commemorative Coin Act of 2008, Public Law 110-450. The obverse of the $5 gold coin shows the United States Army through the ages by depicting soldiers from different periods. Included from left to right are a Continental, Civil War, modern, World War II and World War I soldiers. The obverse was designed by United States Mint Artistic Infusion Program (AIP) Master Designer Joel Iskowitz and sculpted by United States Mint Sculptor-Engraver Phebe Hemphill and also included the inscriptions of "LIBERTY," "2011" and "IN GOD WE TRUST." The reverse shows the United States Army emblem and was sculpted by United States Mint Sculptor-Engraver Joseph Menna. Also shown are the inscriptions of "This We'll Defend," the motto of the U.S. Army and "DEPARTMENT OF THE ARMY," "E PLURIBUS UNUM," "1775," "FIVE DOLLARS" and "UNITED STATES OF AMERICA."